Following last year's extensive collection of singles from the early part of Sun Ra's career, Strut have now announced a second volume covering the singles from the period of 1962-1991. 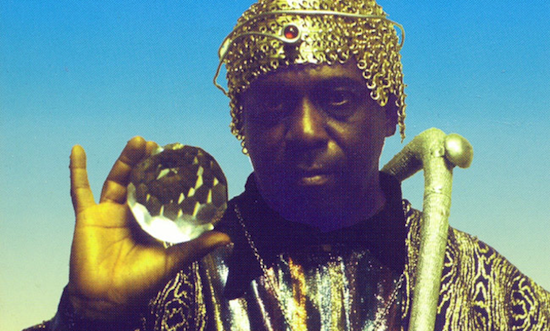 "Released sporadically during the three decades and primarily on the Saturn label, the 45s offer one-off missives from Ra’s prolific cosmic journey, tracing the development of his forward-thinking 'Space-Bop' and his unique take on jazz and blues traditions which remains unlike anything else from the period," says a statement from Strut. Entitled Singles Vol. 2, it will be released as a 3xLP set as well as a 10x7" set. Both editions will feature remastered tracks, rare photos, original artwork, sleeve notes by Chris Trent and track-by-track and session notes by Paul Griffiths. It's due out on May 5 and can be pre-ordered here. It takes in spoken word material amongst a number of sprawling singles from the musician, and the full tracklisting can be checked here.